The BMI260 is the base variant, combining Bosch Sensortec’s high-end accelerometer performance with Bosch’s automotive-proven gyroscope technology. Its high robustness against temperature fluctuations and PCB stress enables extremely precise acceleration sensing. The BMI261 variant is fully AndroidTM compliant and specifically optimized for always-on smartphone gesture and activity recognition. The BMI263 is Bosch Sensortec’s first product to be fully compliant with the latest MIPI I3CSM standard and supports both asynchronous and synchronous timing control. Each device includes a primary and secondary interface that can be configured independently in I2C or SPI. This enables dual SPI configuration, camera modules or auxiliary sensor connections, for example a magnetometer. Finally, the entire BMI260 family enables extended support for data synchronization. 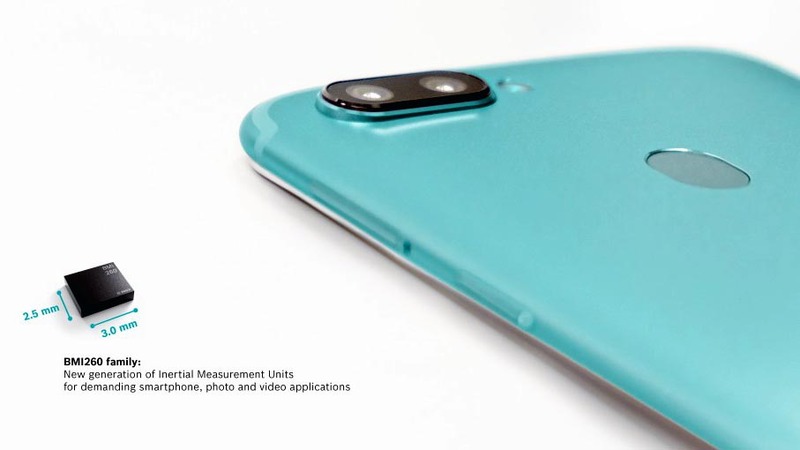 Each of the new IMU devices includes the industry’s first motionless Component Retrimming (CRT) feature for built-in gyroscope self-calibration. This eliminates the need to calibrate the sensitivity of the MEMS gyroscope using a rotation stimulus. This plug-and-play feature promises to significantly accelerate testing and manufacturing processes to further reduce cost and time-to-market for device makers. The new family of IMUs boasts powerful OIS and EIS features. Excellent, low latency (e.g. Google Daydream View compliant), minimal group delays (max. about 600 µs) and high-precision time stamps (accuracy about 40 µs) substantially improve photo and video quality for end users. Dual SPI interfaces enable a single IMU to serve two SPI-based modules, supporting stereo or 3D camera operation. Using the BMI260 family on the mainboard enables congruent HMI and OIS functions, such as stabilized panorama photo panning and action video tagging. Power consumption is kept very low, helping to noticeably prolong smartphone battery life and reduce charging cycles for end users. At a full output data rate (ODR) of up to 6.4 kHz, the typical current draw for both the accelerometer and gyroscope is kept at a level of 700 μA. By enabling high output data rates with low current consumption, smartphone manufacturers can avoid compromising their designs with unpleasant aliasing effects – an effect that causes different signals to become indistinguishable when sampled at lower ODRs. The BMI260 IMU family provides an intelligent power management system enabling all always-on features to run inside the ultra-low power domain of the IMU. Therefore, the host application processor has to wake up only on rare, dedicated occasions, enabling a maximized idle period for the main processor. For example, the system can run reliable gesture and activity recognition features at power draws of merely 30 μA. The new BMI260 family offers a compact package measuring only 2.5 × 3.0 × 0.8 mm3. The IMUs are pin-to-pin compatible with its predecessor BMI160.